We have an application (service) where most of our users are not the direct customer. Most of the users are contractors performing data entry and analysis using our software. We don't have direct access to most users and due to the nature of the analysis it is not appropriate for us to contact a contractor. We can't observe as we can't see the data they are looking at as they may access confidential information. We put a feedback button on the top menu but no one is clicking it. They clearly know how to use the menu as that is how they get to most features. Users would only see Ver 3.10 (other number are only for dev cycles). The button has been out there for months with hundreds of users and no one has left any feedback. The feedback page is just a simple select new feature or enhance existing, text box for input, and a submit button. I don't want to post that page as it has our support phone number. How can we encourage use of the Feedback button without being obtrusive? Thought about "Request" but if they are just plain frustrated we want that feedback too. On the main menu we want to keep every item to one word. Do you think they are afraid that feedback might get them in trouble? We track who submitted but don't display it - if the customer asked us who we would tell them as it is customer data in a way. We have some customers state contractors are "frustrated" but they don't give us specifics. Another dynamic is some of the contract firms have a competing product and they will complain to try and get us out. We track productivity and low producing users will sometimes say to the paying customer that the product is hard to use but not give specifics. If they have real complaints we want to hear them. I suspect that people aren't clicking because giving feedback isn't what they are there to do - they are being contracted to perform data entry. You say you don't have direct access to the users. Do you know how they are being trained? It could be that their managers are being explicit about what they can and cannot do with the software (for instance, they might say "never touch the admin button!"). ..then perhaps "Survey" might convert better than "Feedback". "Feedback" on its own is a bit unspecific: who is giving or getting the feedback? It doesn't automatically translate to "take our improvement survey". If you can apply styling to individual menu items, you could try calling this option out more strongly (with a different background, perhaps), but that might make it too distracting. Ultimately the answer here is to try and understand more about how users understand this application and their goals, then try and design a survey intervention that fits their use better. A follow-up question: can you tell if anyone is clicking the button but then not filling in the form, or can you only count submissions? If you can work out if people are visiting the survey page but not answering the questions, then the problem might instead be how you frame the survey, what right of privacy you tell them they get, or another issue with the copy. The feedback button in the menu bar is a somewhat hidden and the meaning may actually be getting blurred to the user. Another problem may simply be that the users are there to do a job, and providing feedback is (unfortunately) not part of that. One issue is the close proximity to all the menus. If you scan the menu structure below (taken from my Chrome, with "Feedback" added) there really doesn't appear to be anything special about it. While the user may use many of these menus on a daily basis, the ones they don't use are just noise and users will learn to ignore them. It becomes a situation of not seeing what is right in front of your nose. Applying a little Gestalt Psychology to the current layout implies that "Feedback" is actually a menu, not a button. The current UI is mixing metaphors, placing an actionable button in the menu, instead of just menus. A user seeking to provide feedback may not look for such a call to action in the "menu bar". If you are really wanting to get users to provide feedback, make it known and make it clear. Creating a call to action button and giving the button its own space will help users to notice it. Having some descriptive text can also help -- empower the user by giving them the chance to make the product better... but sending feedback! Because the users are generally there to do a different job, you can also not show the box all the time. Make it show up every-so-often. "HEY! Something new and special showed up. Let's click it!" When it is not there, it doesn't get in the way. If the button needs to remain in the menu bar (sometimes you have to put it where you can) then make it distinct from the menus. Move it away from the menu structure and, if possible, give it a slightly different facade. Moving it away from the menus will help it not be confused for one. This too is actually a very valid concern. Though the users are the only ones that really answer this, the fear of retaliation is sometimes a hurdle in gaining feedback. I have been involved in many usability tests in the aviation space where users were extremely concerned about losing their job if they "failed". A great deal of effort was put into "we're testing the system, not you", plus that it is anonymous and the boss will never see. Assessment - a big fancy word that really makes the user think their doing something really important. Actually, probably not a great option though. Survey - if you're walking the user through a few guided questions. But if it is free form entry, don't call it what it isn't. Evaluation / Evaluate - gives the user a sense of purpose around what they are sending back. Criticism - oh yeah! I get to complain! I like complaining! In the end, "feedback" is a pretty universally understood word with a decent amount of power behind it. If you're able to provide more language around the call to action, that will help, as any single-word will have less impact. You can try changing the menu bar to "Suggestions?" with or without the question mark. 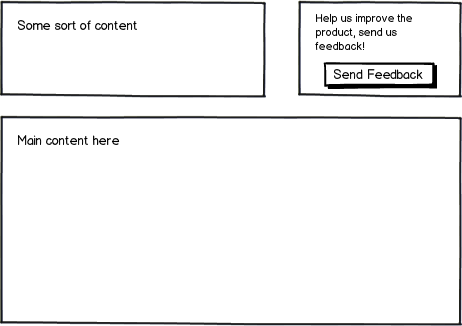 Not to get too skeumorphic but users are familiar with the concept of a 'Suggestion Box' where you would drop in a letter with a complaint, suggestion for improvement, etc. How often do you see that labeled as a 'Feedback' box? If you are really getting zero feedback you could have a random selection of all the suggested synonyms that gets chosen for the menu-bar when the application loads and try to figure out which works best by capturing that value somewhere. Maybe only change the word once a week to make it less noticeable. What about renaming the button as "Feedback/Support"
Speaking from personal experience: the only time users want to talk to you is if they're having a bad experience. Also, I think you're right in thinking that "Feedback" possibly isn't the best term to use. It's just too broad. My immediate thought is to add a start screen that the user must dismiss to start using the app - like Adobe use when there is no document loaded or like FileZilla uses to tell you that there are updates available. This would give you the space to present a more engaging proposition such as "Tell us what you think." or something even more directed like "what features do you use the most?". - Make sure you still give them the option to dismiss it without answering though or they'll really start using that feedback button to tell you they don't like it! I agree that making it a menu item won't help, but in all honesty I think the answer to your question is "pay them". Providing feedback is work, and people won't do it out of the goodness of their hearts. From your point of view, it's for the users' benefit, but they're unlikely to see it that way if they have no direct relationship with you. For all they know you have 500,000 customers and that button will have no more effect than dropping a note in the suggestion box at McDonald's. One thing that might help is to frame it as "support". If you're in a position to offer a two-way conversation, then users are more likely to invest their own time, since if nothing else they'll get to vent. This still assumes their job gives them time to do that, of course. Most likely, though, they'll need a real incentive to make the effort. For instance, you might arrange training or feedback events where the operators actually are being paid to give you feedback. Maybe you could try a gamified approach, like a little face they could punch when they find the current dialog particularly frustrating-- reward their feedback with fun in some way-- but I'm guessing it will come down to money. Not the answer you're looking for? Browse other questions tagged feedback or ask your own question. Fixed Feedback button on the side of LEFT or RIGHT side of the window?